Due out in January, this installment is shaping up to be something special. Monster Hunter World is one of our most hotly anticipated titles of 2018, and the beta has only increased our hunger for the game’s monster-slaying action. 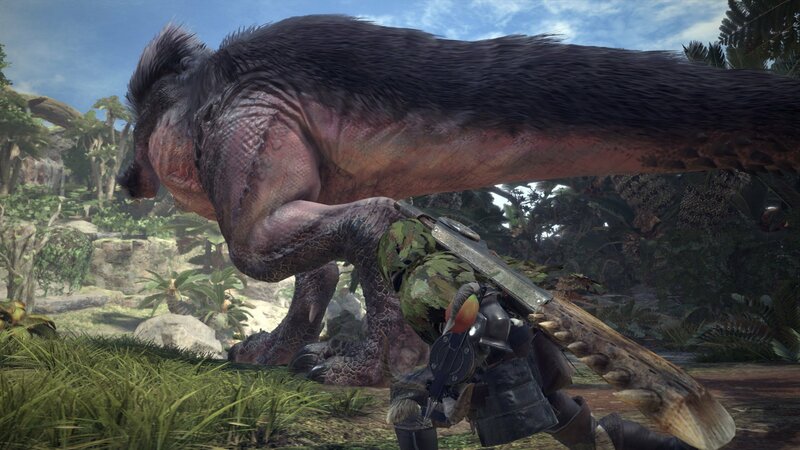 Capcom’s latest entry aims to pull in new and veteran hunters alike with its exciting new mechanics, refined features and fresh beastly behemoths. Past Monster Hunter games have placed certain burdens on the player, often requiring them to seek out various details and subterranean mechanics that can easily be misunderstood or misused. World alleviates some of those burdens and is shaping up to be the most accessible and rewarding Monster Hunter game to date. Here are some things we particularly like. 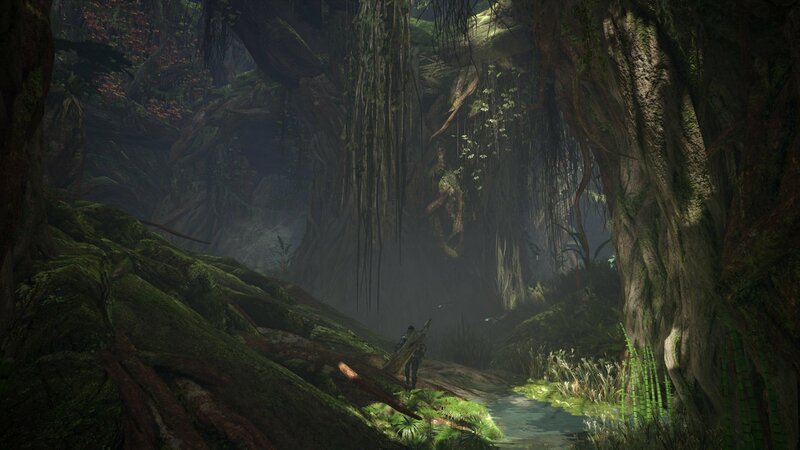 Monster Hunter’s maps have always given hunters plenty of unique habitats in which to hunt their toothy foes. These locations usually range from dense forests, freezing tundras, scorching volcanoes and baron deserts. 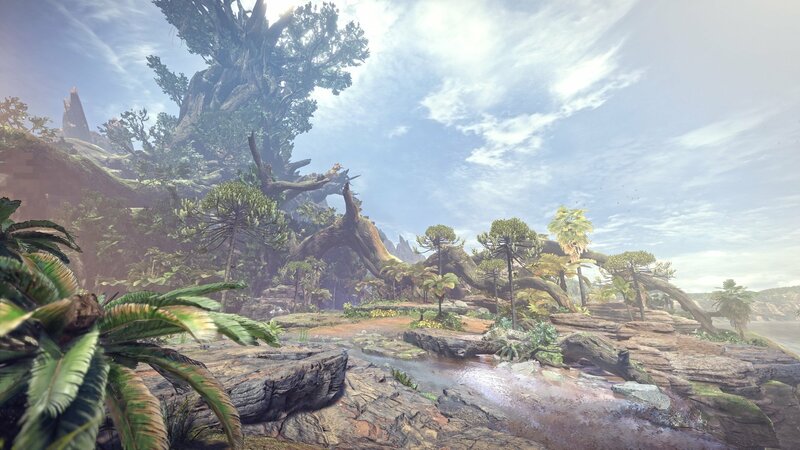 While Monster Hunter World hasn’t ditched any of these core areas, it has made them larger and filled them to the brim with all kinds of pretty plants and beautiful wildlife. There’s also a huge emphasis on elevation, with maps requiring the player to climb up rocky cliffs or scale gigantic trees to access different tiers of the map. Each location still retains the numbered zones of the past games to keep communication between party members simple, but there are no longer loading screens between individual areas. This change is huge as you’ll now be able to seamlessly hunt without any interruption, while also dispelling the frustration from getting punted into the next area and having to wait a few seconds. However, this also means it will be harder to lose a rampaging monster when it’s gunning for you at full speed. To account for the huge size of each map, there are now multiple camps you can choose from when you’re starting up your quest. Running to and from each area can take a lot of time, especially when you’re tracking a particular monster. Luckily, you can fast-travel to the camps dotted around the map as long as you’re out of combat, making for less time spent backtracking and more spent monster-slaying. 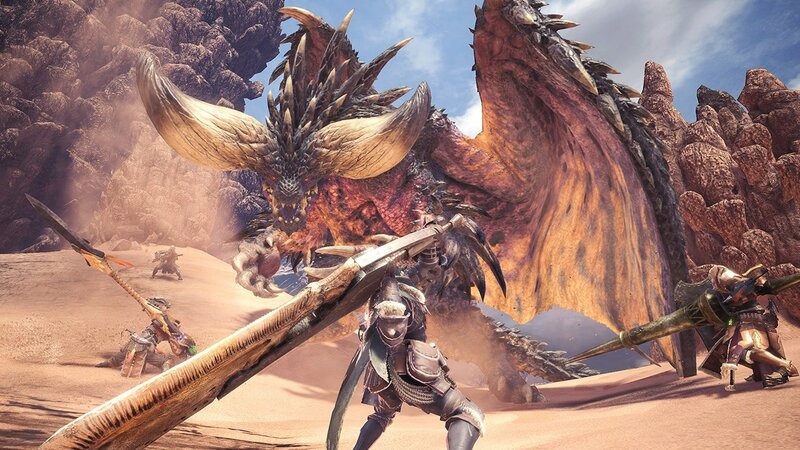 Going into a quest and finding a monster is resistant to your weapon element can often make hunting extremely frustrating and double the amount of time required to slay them. Fortunately, Monster Hunter World lets you change your gear at any of base camp locations. This new feature allows you to constantly adapt your hunting strategy and tailor it to what you think would work best. It’s fantastic to be able to use a ranged weapon like the Heavy Bowgun to break hard-to-reach areas, then switch to the Long Sword to hack off a monster’s tail. Having this freedom to mix things up greatly increases the tactical approach to each hunt. Did we mention that you can also eat at camp as well? These delectable dishes don’t just look stunning, they also give you various skills and bonuses that will aid you during your hunt. There’s no excuse not to fill your boots when you can chow down on some monster themed grub at camp. So tasty! Past Monster Hunter games always showed the vicious fights between monsters in the form of in-game clips, but they often had little to no interaction with one another. Sure, you’d see a Rathalos munching on a poor Aptonoth from time to time, but none of the bigger beasts ever engaged in kaiju vs kaiju brawls. You could get two monsters to accidentally attack each other by leading them into one other, but they never tore each other to shreds as a result. However, the interactions between the game’s various beasts have changed for the better. Now monsters will compete in turf wars if you manage to lead one creature into another’s path. What follows next is usually a brutal skirmish of deadly teeth, razor-sharp claws and blood-curdling roars. It’s a real marvel to see the T-Rex like Anjanath pick up a Great Jagras by the neck and shake it like it’s nothing more than an over-glorified chew toy, before slamming it down on the ground with an almighty thud. These monstrous brawls are not only an awesome showcase of the game’s animations – they’re also a great way to lower a monster’s health during a quest. The interactions don’t just stop there though, as Monster Hunter World has put more thought into how the player interacts with the environment around them. While Monster Hunter 4 Ultimate introduced verticality and the ability to mount monsters, World refines these features and adds new ways for adventurous players to disrupt their beastly opponent. 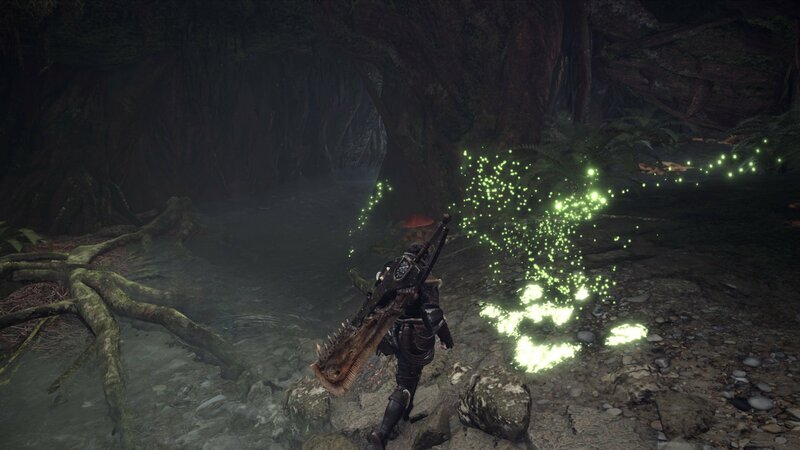 Hunters can now use rotten trees and vine-wrapped rocks to trap unsuspecting wyverns, while a well-timed blast near a dam can send an eruption of water that sweeps a monster off its feet and forces them to crash down into the area below. Meanwhile, the addition of Scoutflies makes for a more engaging way to track the game’s monsters. In World you’ll be able to find various footprints, drool and other monster markings with the help of the game’s friendly critters. Once you’ve tracked the monster to its lair an icon will appear on your map and you’ll be notified of its location. The more samples you collect, the easier it is to track a monster and you’ll gain valuable information, like elemental weaknesses and carve chances. 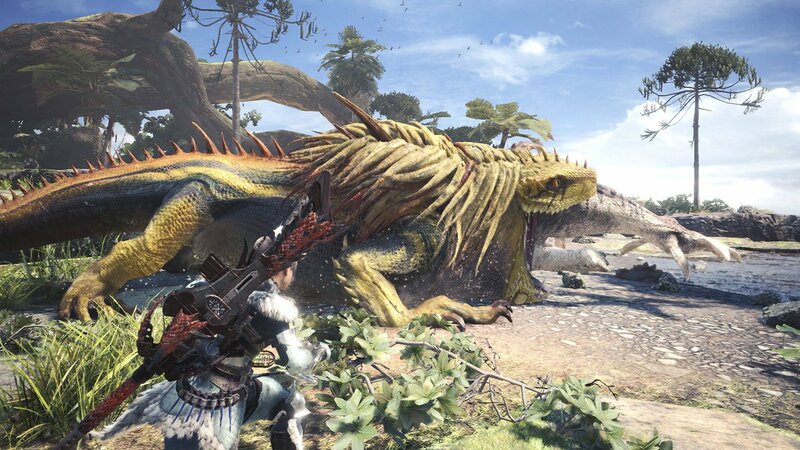 Repeatedly hunting the same wyvern will take less and less time the more you encounter it, which greatly compliments the core hunting loop of the series. The world of Monster Hunter feels more alive than ever and these new interactions make us feel like a true hunter gatherer. You no longer need to painstakingly forge both gunner and melee armor sets anymore, so you can change weapons on the fly without changing your attire. Armor skills have also changed and the way you get these skills has been made a lot simpler. Previously, armor skills were awarded for wearing multiple pieces of armor, but now every armor piece offers a single skill. However, better armor will offer set bonuses on top of these individual skills, meaning the best sets will reward hunters with more abilities for using a complete set. Getting rid of the old skill tree also offers even more mixing and matching than ever before, so those of you who love to fashion-hunt will enjoy the endless possibilities offered here. 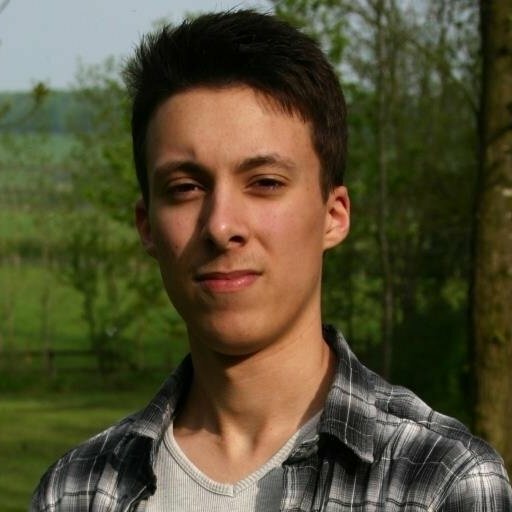 Upgrading and forging new weapons used to come with a bit of trial and error, especially if you didn’t have a handy weapon tree spreadsheet in front of you. In previous games it wasn’t uncommon to end up forging and upgrading a weapon only to find it didn’t follow the path you initially wanted to go down. World’s huge weapon tree is more accessible than ever and lets you downgrade items if you’ve realised you’ve gone down the wrong path. You can downgrade back to a previous incarnation, but there are certain points on the upgrade tree where there’s no going back. Lastly, you can now pick and choose the items you want to craft and add them to your hunter’s wishlist. The game will then tell you what materials are required, so you don’t have to keep track of what monster parts you’re missing. As soon as you have every item required to forge an item, the game will tell you without forcing you to check what you need at the smithy. After all, it can be difficult to keep track of your monster shopping list when a rage induced Diablos is charging after you! Hunters now have access to game-changing cloaks that offer unique abilities for short periods of time. These Mantles create new strategies and bring exciting dynamics to a hunt, especially when used in coordination with other players. The Ghillie temporarily conceals you from enemy view, the Glider increases your jump airtime and allows hunters to ride strong winds, the Challenger makes monsters target you more often, and the Rocksteady reduces the damage taken from attacks and prevents wind effects, protects your hearing, and grants tremor resistance. These Mantles have a per-use cooldown, so hunters must choose wisely when using them. Gathering materials for Monster Hunter’s various consumables and ammo has been made less of a chore in Monster Hunter World, and we’re glad that we no longer have get our hands dirty while searching for herbs. Gathering mushrooms, bones and even dung has always been a pretty crappy part of Monster Hunter and it often takes away from the action we know and love. While World hasn’t completely rid us of this chore, it has streamlined it so that it takes less time. You can now quickly pick up various items when on the move and instantly convert them into the items you need via the handy auto-crafting mechanic. Lastly, if you find you can’t craft an item because you need to make another item, World will take some of this hassle away. For example, to make a Pitfall Trap, you need a Trap Tool and a Net. If you have Ivy and Spider Web, you’ll be able to craft the Net straight from the crafting menu. These changes may be small, but it does make it much easier to tick off our virtual shopping list as we hunt.